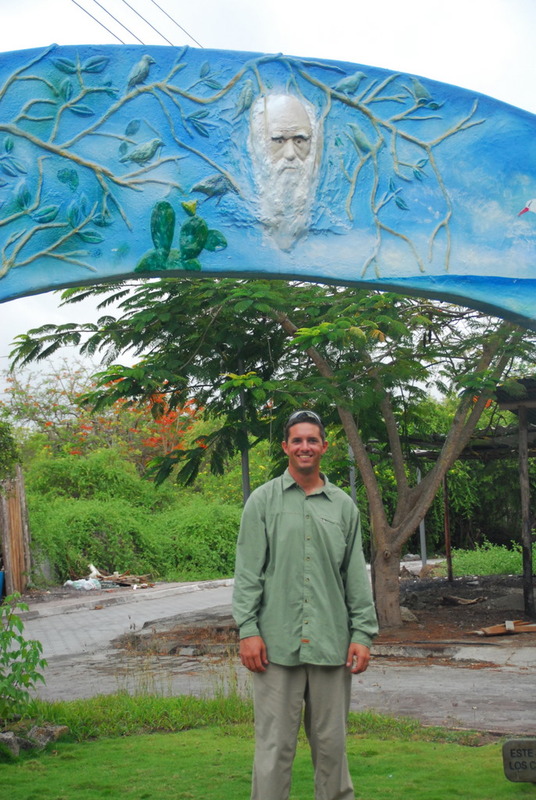 For people like me, that don’t have religion, the Galapagos is kind of like Mecca. It was the birthplace of the evolutionary creed. Complete with God-like idols of Charles Darwin. So for me, at least, this trip was a pretty big deal. But really, it’s hard to look around these islands and not understand what Mr. Darwin was thinking. Each island has it’s own species or subspecies. The differences between the islands lead to different variations on animals that do different things. It’s the only place with tropical penguins, birds with blue feet and iguanas that swim. The most remarkable thing about the place, however, is that the animals have no fear of people. You can approach the animals and in many cases reach out and touch them (though you’re not actually allowed to), and they seem completely oblivious to your presence, or even interested in you. The sea lions are particularly known for playing with tourists. Over the next few posts, we’re going to share what we saw, where we went and so on, but we’ll start with how our routine typically went. Just about the only way to see a fair amount of the Galapagos is on a cruise, sleeping aboard a boat transporting you from place to place overnight. There are land based options, but they’re both more damaging to the environment and less enjoyable since you spend so much of your time traveling to and from a destination. Of course, they are cheaper than boats and if you get seasick are probably more appealing than spending your evenings over the railing. 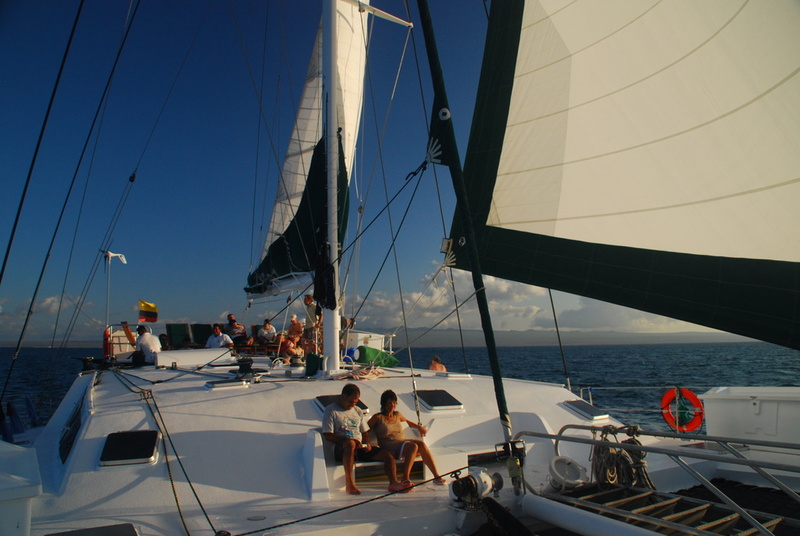 But in Quito we found a very good last minute special on a first class catamaran, the Nemo II, and so booked it and headed out to the islands. 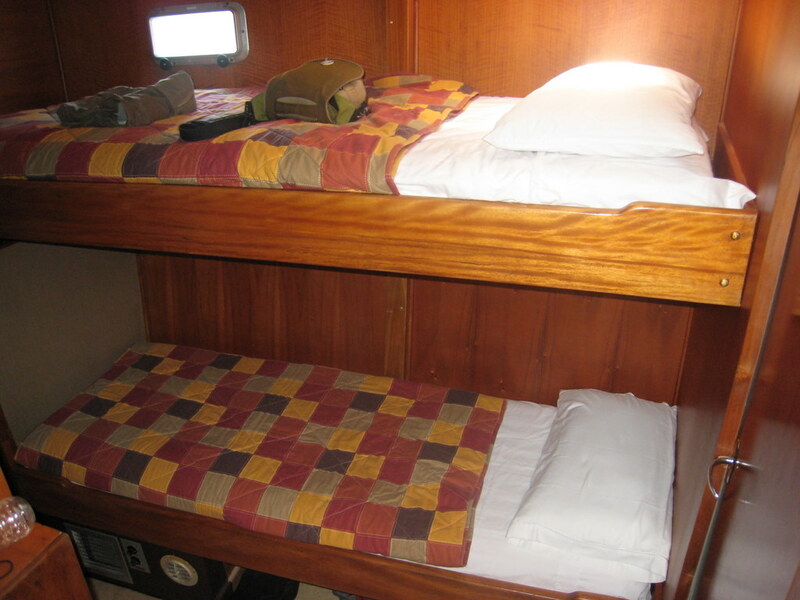 Though space was certainly at a premium (and being the last minute passengers, we had the smallest cabin with bunk beds), the boat was a beautiful motorsailing catamaran, and felt exactly like how we should be traveling the Galapagos. Lounging on the top deck as the sun set (or rose!) 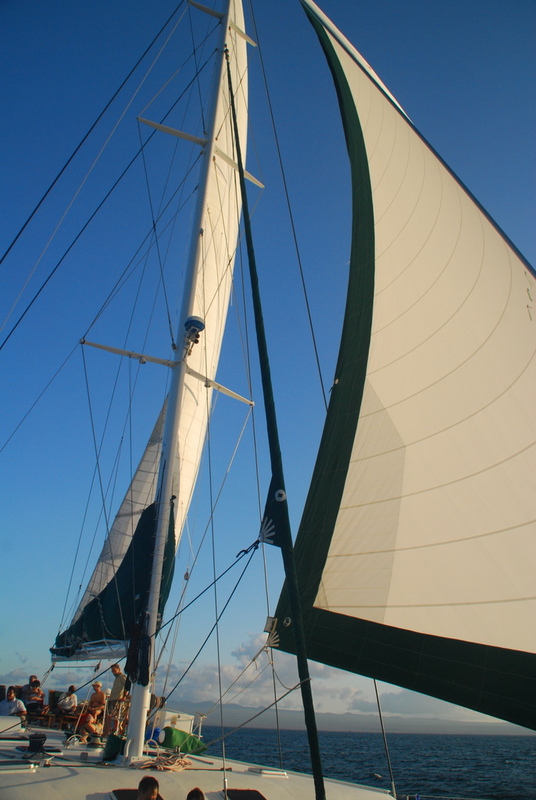 with the sails fully extended or laying on the catamaran netting just above a group of leaping dolphins could not have been more perfect. Aboard, our days were just packed. Morning wake up call was at 6:30 followed by breakfast served at 7. By 8 we were expected to be ready for our first landing of the day, lasting between 2-3 hours walking on short trails along with plenty of time for our guide to explain all the things we saw. We would return to our boat in time to do a bit of snorkeling before lunch at noon aboard the boat (no food is allowed on shore except in the three port towns). Around 2 pm we’d have another landing comprising of either a short hike or free beach time or more snorkeling or free time in port. If we were traveling that evening, we’d often start before sunset to look for dolphins or whales. After watching the sunset around 6:30, dinner would be at 7 and then it was relaxing time. All in all, it was a full day, and we were usually exhausted and fell into bed before 10 … especially since we had a 6:30 wake up call the next morning. All this week we’ll be documenting our trip, and don’t worry, your wishes have been heard. We will be posting plenty of photos — with over 1600 of them, it’s just a matter of choosing which ones!